The majority and dissenting opinions, 171 pages in length, are to be read with the Court’s separate fact findings, and the Court’s March 10 opinion on Plan C185. The two judges also sustained the racial gerrymandering claim as to HD 117 in Bexar County, but not as to HD 77 and HD 78 in El Paso County. They also found that while the plaintiffs did not prove a statewide violation under one person, one vote claims, they did prove them as to violations in Nueces, Hidalgo, and Bell/Lampasas County districts (HDs 32, 34; 31, 36, 39, 40, 41; and 54 and 55 respectively). The latter required electoral districts to be drawn according to population and to make the districts equivalent in population. Dissenting Judge Jerry Smith addressed the fundamental issue of jurisdiction saying as in his March 10, 2017, dissenting opinion on the 2011 Plan C185, the judicial proceedings for Plan H283 are moot. “Nothing has changed to fix that fatal defect.” He opined that the panel should “promptly dismiss” the case for lack of jurisdiction. 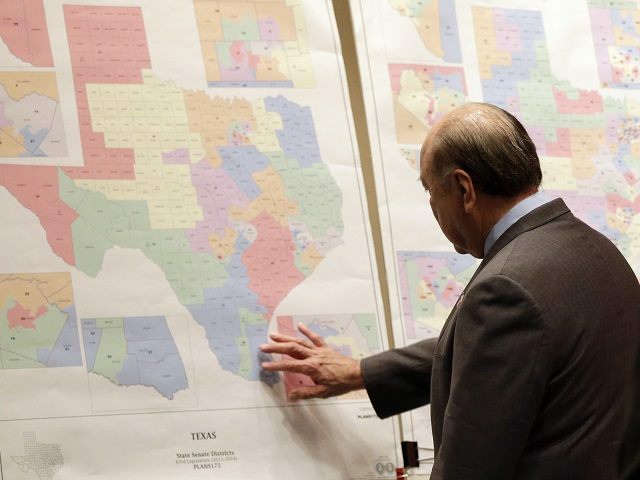 As reported by Breitbart Texas, the same two judges released an opinion in March accusing Texas legislators of drawing a congressional map in a “rushed and secretive process” that intended to discriminate against Hispanic and Democrat voters. The opinion nullified districts 27 and 23 represented by U.S. Representative Blake Farenthold (R-Corpus Christi) and Rep. Will Hurd (R-Helotes). District 27 stretches from Corpus Christi to Bastrop County near Austin and Wharton County. District 23 covers southwest Texas along the majority of the state’s border with Mexico and is west of western San Antonio. The panel also held that legislators intended “to unseat” Rep. Lloyd Doggett (D-Austin) in District 35 by drawing a map that would help a Hispanic representative be elected. They wrote the district was drawn to create the “façade of comply[ing]” with the Voting Rights Act. They also ruled that the Black population in Austin was purposely split to achieve the goal of unseating the Democrat incumbent. Ending his dissent with “Stay tuned,” the judge nominated by Ronald Reagan foreshadows what will most certainly be a further fight in the courts, including the appellate courts. This Order on Plan H282, like the Order on Plan C185, raises many questions because it does not set forth how the alleged offending maps will be replaced.